Until recently, sustainable investing was a niche in the broader financial landscape. But today, environmental, social, and governance (ESG) factors are increasingly important to mainstream investors. Large financial firms like Bloomberg, Morgan Stanley and Goldman Sachs are expanding their ESG product and service offerings. Going forward, women and millennials are poised to manage a greater share of global wealth, and to do so in a way that aligns with their values about fairness, the environment and human rights. In the face of rising economic inequality and mounting evidence of the negative externalities of business practices, financial firms are under pressure to demonstrate that they can deliver value in today’s global economy in ways that work for people and communities around the world. A new paper from the NYU Stern Center for Business and Human Rights focuses on the social (“S”) performance of companies, defined as the operational effects of a company on the labor and other human rights of the people and communities it touches. Standards that define these rights are laid out in multiple international instruments, including the Universal Declaration of Human Rights and the Core Conventions of the International Labour Organization. While originally developed for governments, these standards have been extended to the business context and provide a strong foundation in which to ground the scope and meaning of “social” performance. Over the past three decades, a multi-faceted industry has evolved to offer reporting services on ESG factors to investors and other stakeholders. 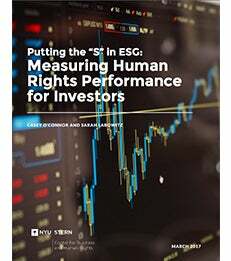 Investors should be able to rely on the ESG industry to provide data that helps them identify strong performers and assess risk. When it comes to evaluating companies on their toxic waste emissions (“E”) or vulnerability to fraud and corruption (“G”), investors now have tools to assist them. But our analysis of 12 leading ESG frameworks shows that the ESG industry is still falling short of this objective when it comes to “S”. Social measurement evaluates what is most convenient, not what is most meaningful. Current approaches to disclosure are not likely to yield the information needed to identify social leaders. The lack of consistent standards underpinning social measurement increases costs and creates confusing “noisiness” across the ESG industry. Existing measurement does not equip investors to respond to rising demand for socially responsible investing strategies and products.